Today’s blog posting is a quite interesting one, because I want to show you a concrete example where in an Actual Execution Plan the Actual Number of Rows are WRONG! Yes, you have read correctly: I’m talking here about the Actual Number of Rows, and not about the Estimated Number of Rows, which are always somehow wrong, because they are only estimated during the Cardinality Estimation. SQL Server returned here within SQL Server Management Studio 110561 rows, but the Actual Number of Rows within the Actual Execution Plan are much higher: 118968! Wow, this is a quite interesting behavior. And I don’t think that this behavior is just by-design. The problem lies in a Filtered Non-Clustered Columnstore Index that was introduced with SQL Server 2016. You can create a Filtered Non-Clustered Columnstore Index in an OLTP workload to support so-called Realtime Data Analytics Scenarios. Instead of creating a dedicated Data Warehouse database you perform your Analytics workload directly on your OLTP tables, which can be also changed concurrently. This means now that a Non-Clustered Columnstore Index is also changeable since SQL Server 2016. 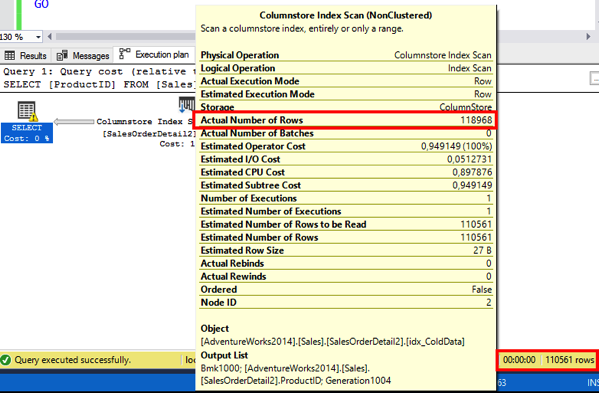 And in that behavior lies the problem: when SQL Server calculates and returns you the Actual Number of Rows, the deleted rows from the Non-Clustered Columnstore Index are also considered. And therefore the Actual Number of Rows in the Execution Plan are just higher as the real row count that is returned from the query. The following T-SQL code shows a simple scenario with which you can reproduce this scenario. Never, ever trust anyone – especially not a piece of software! I find this behavior quite funny, because until I encountered this specific scenario I always thought that the Actual Number of Rows are somehow calculated on-the-fly during the Query Execution. But it seems (at least in combination with a Non-Clustered Columnstore Index) that this is not really always the case.